We have managed to combine two of our biggest passions on our holidays on the Eifelsteig. My wife and I are truly anglophile – despite the Brexit. Despite she has left the country to stay with me in Black Forest. It seems natural for us to love detective stories, too. I remember the days of my childhood. My parents send me to bed, but I managed to tiptoe to my grand mother. Once a week, we watched Miss Marple on grand mothers black and white TV set. Of course the old fashioned series with Margaret Rutherford and her husband in real life, (James Buckley) Stringer Davis. In June, we met the resolute old lady again at the Krimihotel Hillesheim. A small hotel, where every room is decorated to memorize some detective character or special agent like 007. By the way: They say, that Miss Marple must have been 111 years old when she solved the last crime – if you ad up all the time mentioned in Agatha Christies books. 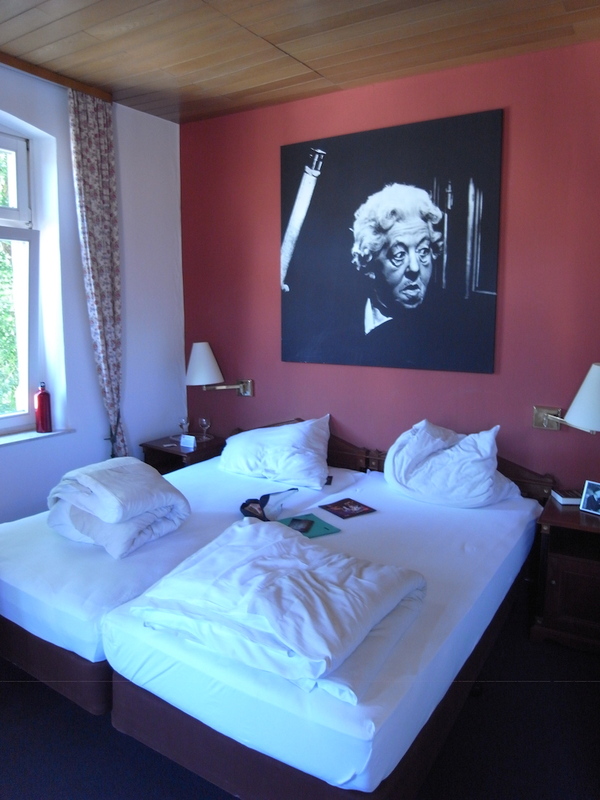 Despite a lot of suspicious people in the hotel, you sleep well – as Miss Marple herself is your guard. If you like, you can go chasing criminals by yourself on special events at the Krimihotel – or have a very delicious meal at the Biergarten in the back of the house. With the hotel as our starting point, we followed our second big passion – hiking. The Eifelsteig is a spectacular long distance hiking trail, more than 200 miles long. 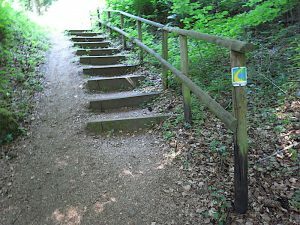 It leads in 15 stages of 14–28 kilometres (8.7–17.4 mi) from the Aachen district Kornelimünster to Trier and is maintained by the Eifel Club. We took six stages with about 60 miles. „Steig“ means rise or climb. You see why? It’s been a very hot June this year – more than 35 degree celsius on some days. 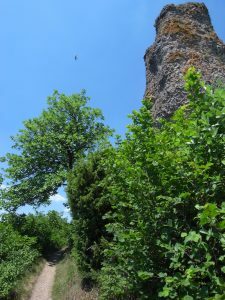 As we are not that trained people, we had to carry, drink and sweat about three liters of water per day. 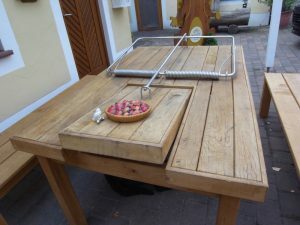 The Café Mausefalle in Neroth says, it’s got the biggest Mausefalle (mousetrap) in the world. The regional tourist office Eifel Tourismus GmbH offers help, information and easy booking of the tour. Of course you can travel without carrying your luggage.